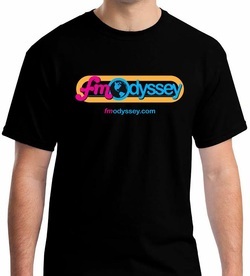 FM Odyssey T-Shirts Are Finally Here! FM Odyssey is a self supported weekly 3-hour radio show, heard on many public and NPR affiliates each week for the past 24 years..
Wanna help keep it going? Requested by YOU for many years and now they are finally here! Proudly display your favorite radio show! Every purchase supports FM Odyssey programming. Pre-order now, which will give us an idea of how many of what sizes we'll need.